Prep Time: 5 min. | Cook Time: 15-20 min. 1. Combine mangos, mustard, sugar and thyme in a medium bowl. 2. Season with salt and pepper to taste, set aside. 3. Preheat outdoor grill or indoor grill pan over medium-high heat. 4. Place four bratwurst on hot grill, cover and cook for 15 to 20 minutes; turning often until internal temperature reaches 160°F. 5. 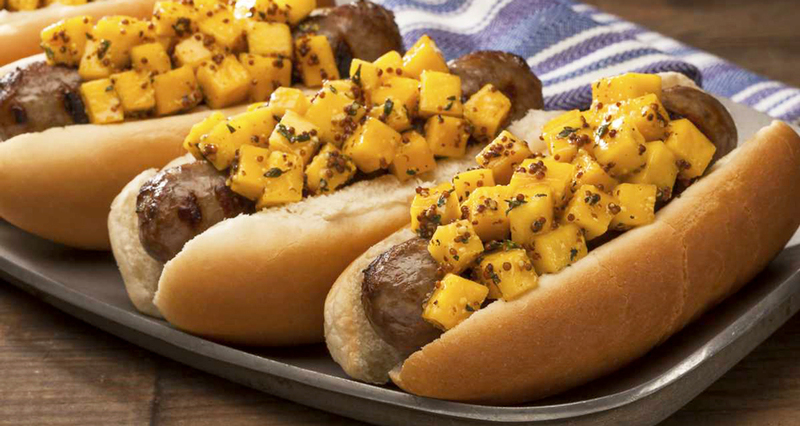 To serve, place cooked bratwurst in hot dog bun and top with mango relish. Each serving (1 bratwurst with ¼ cup relish) contains 340 calories, 35g carbohydrate (12% Daily Value), 4g fiber (15% Daily Value), 24g protein (48% Daily Value), 13g fat (20% Daily Value), 12g saturated fat (59% Daily Value), 80mg cholesterol (27% Daily Value), 258mg sodium (11% Daily Value), and 626mg potassium (18% Daily Value), 85mg vitamin C (142% Daily Value), 2576 IU vitamin A (52% Daily Value), 40mg calcium (4% Daily Value), 1.5mg iron (8% Daily Value).